A light snow event affected the area this afternoon and evening, with widespread totals near and slightly above an inch observed, making this the biggest event across the area since 1/21 in Long Island, 1/16 for interior areas, and 12/29 in NYC. Cold temperatures will continue on Saturday, although following a snow/rain/freezing rain event on Monday, a short lasting warm up is expected next week with highs returning into the 40s with widespread rain for the mid week before a colder pattern returns. As of this evening, light snow continued to fall across the area; while precipitation amounts remained minimal, higher snow to liquid ratios resulted in totals near an inch across most of the area, locally higher for some locations. While some locations slightly exceeded the forecast, the storm as a whole was much weaker and further south than original expectations which had a stronger low pressure developing over the Ohio Valley, a scenario which did not end up verifying. Instead, a weak, relatively flat and progressive low system quickly moved through the region, producing widespread 1-3 inch totals with locally higher amounts. While most of the area has seen accumulating snow at some previous point this month, today’s snow event ended a nearly month-long streak of no accumulating snow in Central Park since 12/29. While November was much snowier than average, since the beginning of meteorological winter on December 1st, there have only been two measurable snow events; 0.4″ on 12/29, and an inch today, making today’s minor event the biggest storm of the meteorological winter season so far. A poll was opened earlier this week regarding how much snow would fall in NYC with this storm, below are the results, with the correct answer bolded. Cold temperatures are expected again tonight, dropping into the upper 0s inland and low to mid 10s for the rest of the area, with mid to upper 10s in NYC and parts of Long Island. Partly sunny skies and cold temperatures are expected for Saturday, with highs in the mid to upper 20s inland and the upper 20s for the rest of the area. Another similarly cold night is expected for Saturday night, with highs on Sunday warming back up into the upper 20s to low 30s. The current cold pattern will end on Monday as a trough digs in the western US and a low pressure makes its way towards the Great Lakes, with a warm front moving through the region, producing widespread light to moderate precipitation. At this time, most of this precipitation is expected to remain to the north of the area, in the form of snow and ice, although the concern is there for steady light freezing rain especially for interior parts of the area from late Monday afternoon through the evening and overnight hours. Temperatures aloft are expected to quickly warm up above zero degrees Celsius as the precipitation moves in, but with surface temperatures holding in the upper 20s inland and upper 20s to low 30s closer to the NYC north/west suburbs. The outlook for Monday is still subject to minor revisions, although at this time, the latest expectation is for precipitation to begin in the afternoon and continue through the early overnight hours. This is likely to start out with light snow in northern NJ and especially in SE NY and southern CT; as temperatures aloft warm up, a changeover to light freezing rain is likely north and west of NYC and into parts of southern CT, with locations near NYC and further south/east seeing a brief period of light snow changing over to rain. By late Monday night into early Tuesday morning, temperatures will warm up enough for any leftover freezing rain to change over to plain rain. Any snow accumulations will remain minimal and are likely to focus north and/or NW of the area, with freezing rain accumulations the main risk at this time. 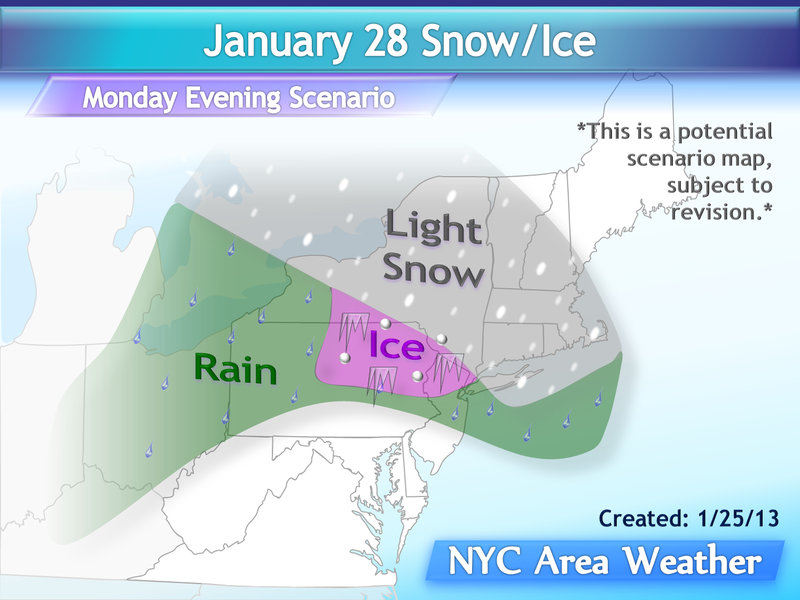 Stay tuned for more information on this possible light snow/ice event. Following the front end wintry precipitation, temperatures will warm up enough for plain rain across the area on Tuesday and Wednesday as an intensifying low pressure tracks through the Great Lakes region, bringing a cold front across the area on Wednesday. Currently, I am siding towards the models less amplified and weaker with this low, which should still bring unseasonably mild temperatures on Tuesday peaking in the mid to upper 40s across the area, perhaps reaching and/or slightly passing 50 degrees in the warmer case scenario, although at this time cloud cover and scattered showers are likely to keep temperatures below 50 degrees for most of, if not all of the area. Rain from the cold front is then expected on Wednesday, ending by Thursday. The warmer temperatures next week are only temporary, as a strong cold air mass building over Alaska gradually spills southeast towards the US by late next week. The coverage area and intensity of this air mass is not nearly as strong as this week’s cold, with the coldest temperatures focusing towards the north central US, although colder temperatures are expected again with highs likely back into the 20s/30s with lows in the 10s. Some of the model guidance initially showed a potential storm late next week, but have largely backed away. While at this time, a significant storm is unlikely, the potential for a storm will be watched. More information on the longer range, as well as the February outlook, will be posted with Saturday’s long range outlook.